The Vancouver Condo Buzz » Luxury Westside Vancouver Kerrisdale Gardens Homes for Sale > Only 27 Exclusive Kerrisdale Homes available with Riesco & Lapres Interior Design! Luxury Westside Vancouver Kerrisdale Gardens Homes for Sale > Only 27 Exclusive Kerrisdale Homes available with Riesco & Lapres Interior Design! An unbelievable team of designers and architects will be launching a prestigious Westside Vancouver Kerrisdale real estate project this Fall 2013! Called the Kerrisdale Gardens condos in Vancouver, these amazing homes will be located in a highly sought after neighbourhood and will only offer an exclusive 27 residences. The architecture will be designed by Allan Diamond Architect and the interior designers will be from Riesco & Lapres, an award winning company known for their attention to detail, fine craftsmanship and European inspired collections. The development management team will be from the Altus Group while marketing and sales will be by Colliers International Residential Marketing. The project site is at 2128 West 40th Avenue Vancouver Westside where you will find only twenty seven luxury condominium residences in the prestigious Kerrisdale neighbourhood. The layouts featured at the presale Vancouver Kerrisdale Gardens condo project will include one bedroom to two bed plus den layouts that are open concept, functional and bright. One of Vancouver’s oldest and most distinguished neighbourhoods, Kerrisdale’s intimate and understate affluence is unmatched within the Westside Vancouver real estate community. From the beautiful boutique shops to world class cuisine and from the expansive urban green spaces and parks to amazing recreational options, the luxury Vancouver Kerrisdale Gardens condos will be a welcome addition to this west side location. The marketing states that Kerrisdale is simple, pure, walkable and livable. We agree fully with this! 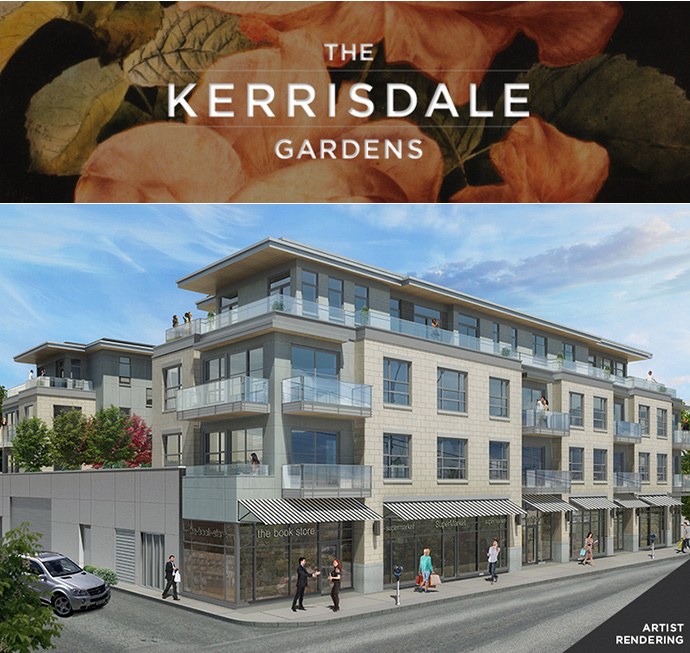 For more information and to register your interest, please visit the Kerrisdale Gardens Vancouver condo marketing site at www.kerrisdalegardens.ca today! When it comes to true Westside Vancouver living, there is no better place to experience it then in this truly established and unique neighbourhood. 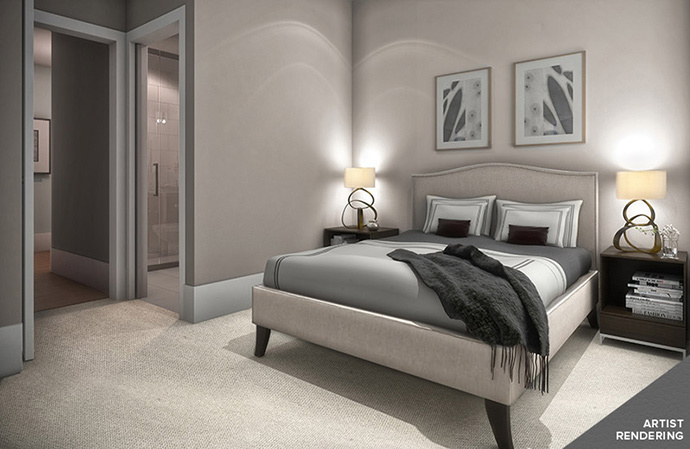 The European influenced designers from Riesco & Lapres will give the prestigious Vancouver Kerrisdale Gardens condos an understated elegance that will be timeless and beautiful. From the selection of materials to the colour palettes, Riesco & Lapres will give home buyers a unique and stunning home that is bright, airy, detailed and subtle. 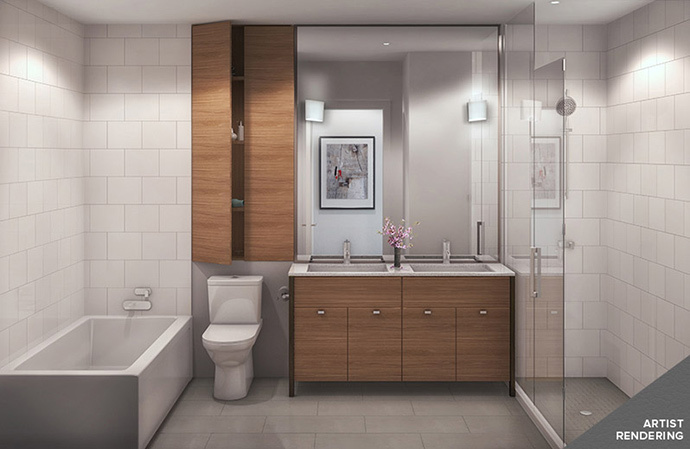 Many of the new Vancouver Kerrisdale Gardens condo floor plan will have convenient powder room for guests in addition to expansive and spa inspired ensuite bathrooms. The vanities will feature luxury Calacatta marble counter tops, warm wood cabinets and burnished brass legs to complete a contemporary yet traditional look and feel. The spacious living areas will have full sized furnishings that home buyers are looking for in a true West Side living experience. The unique and beautiful finishing touches by Riesco & Lapres are integrated throughout the design of the homes to give it an exclusive feel. The oversized windows and nine foot ceilings at the presale Vancouver Kerrisdale Gardens condos floor the living space with natural light. The bedrooms will also be oversized and will easily accommodate a full sized king size bed. The master retreats will also feature beautiful walk in closets as well as ensuite bathrooms with two vanities, a soaker tub and a separate shower. 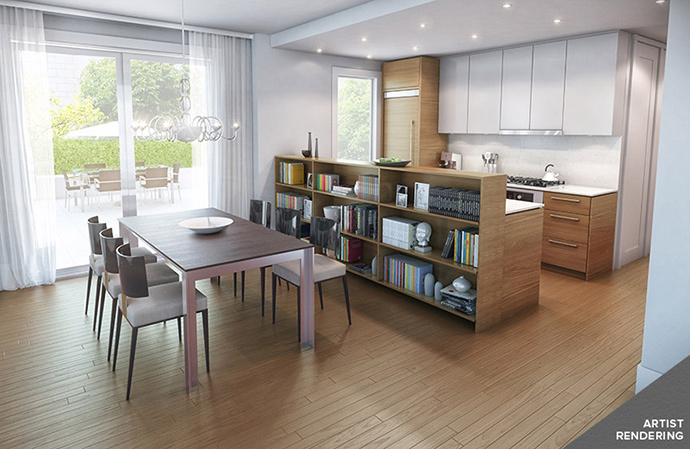 The open plan kitchen and dining areas at the new Vancouver Kerrisdale Gardens homes for sale will feature premium brand name European appliances, custom millwork, lots of storage and cooking/entertainment space. There are four unique Vancouver westside penthouses available at the boutique Kerrisdale Gardens project that includes The Orchid floor plan with 2 bedrooms and a den plus 2 bathrooms and 1 powder room. The interior living space is 1,279 square feet plus a 536 square foot wrap around terrace. The Rose floor plan is another Vancouver westside penthouse layout that has 2 beds/den plus 2.5 bathrooms and it is slightly smaller at 1,267 square feet plus a much larger 788 sqft terrace (wrap around again). The Hydrangea floor plan is 2 bedrooms plus den and 2.5 bathrooms at 1,125 square feet interior plus 337 sqft terrace deck. Last but not least is the 1,205 sf Lotus floorplan that has 2 beds/den and 2.5 baths with a 113 sqft terrace. The Magnolia floor plan at Kerrisdale Gardens Vancouver westside condos is 1,236 sqft with a massive 1012 square foot terrace. It also has 2 bedrooms plus a den. The Jasmine floorplan is 1,064sf with a 289sf terrace. The Peony Vancouver Kerrisdale Gardens floor plan is 1,198sf plus a 610sqft terrace. All 3 are two bedroom plus den layouts. There are four different 2 bedroom floor plans that range in size between 873 square feet to 1,029 square feet. The one bedroom plus den Kerrisdale Gardens Vancouver floor plan is The Daffodil and it is 679 square feet plus a 352 sqft terrace. Dimensions, sizes, specifications, layouts, flooring direction, and materials are approximate only and subject to change withoutnotice as reverse plans occur throughout the development, and balconies andterraces may vary from unit to unit, refer to architectural plans for exact layout. E.&O.E. The Kerridsale Gardens homes has a timeless quality that will endure for generations. The building itself will blend seamlessly into the established neighbourhood and the private view includes terraces, and private central gardens. The southern exposure of the Westside Vancouver Kerrisdale Gardens homes will be framed by old growth trees, which is simply beautiful. Located at 2128 West 40th Avenue Vancouver Kerrisdale Gardens condos will feature just 27 homes for sale. This highly sought after Kerrisdale Vancouver Westside location is just the start of the incredible features of this new development. The floor plans at Kerrisdale Gardens Vancouver luxury condos include one bedroom plus den to two bedroom and den layouts. Some of the impressive interior features include gourmet kitchens and spa inspired bathrooms that are designed by Riesco & Lapres, 3 passionateand European inspired designers who are well known for their ability to understand the subtleties of what makes a home fit in this one of a kind neighbourhood. The Westside Vancouver Kerrisdale Gardens luxury homes is now open by appointment only or you can register online at www.kerrisdalegardens.ca. Straight from their email registration: Thank you for your interest in The Kerrisdale Gardens – an exclusive collection of exquisitely designed one bedroom plus den, two bedroom, and two bedroom plus den homes. Given the exclusive nature of this offering, our initial release of single-family inspired homes are for sale by private appointment only. We look forward to connecting with you and discussing what features initially caught your attention. Private appointments will begin this September. Our sales team will be in contact with you shortly to arrange an appointment at a convenient time and location – at your home, at your office, or a coffee shop or restaurant in Kerrisdale.